I believe this is one of the happiest days of your life and I approach each wedding with a fresh perspective and fun attitude. Understanding that each couple is unique in their style, personality, and biography I strive to produce images that reflect that individuality. My focus is on an artistic editorial style of photography and I tell the story of your wedding day through imagery. I’ll highlight the laughter and joy that you and your guests will be feeling throughout the day. I understand my client’s need for classic products and exceed their expectations by representing the grace, distinction, and style that is possible in wedding photography. I’ll be with you through the entire wedding process. From the concept to the final captured images, I’m your expert, resource and guide. Hiring me will give you more than just a beautiful day of celebration, it will give you a lifetime of memories in the form of timeless photographs. Associate photographer Julia began with Janae Shields Photography in 2011 and has been capturing happy moments for our clients ever since. Together we bring over 16 years of experience photographing weddings and look forward to many, many more. 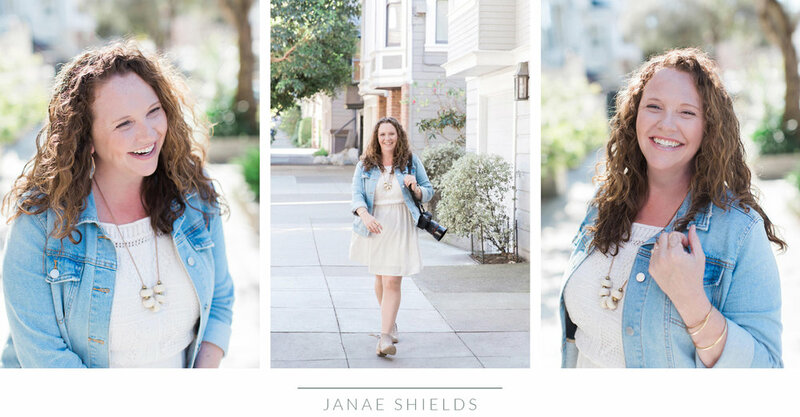 Janae is available for weddings worldwide and specializes in San Francisco and Wine Country weddings and Julia is available throughout the Bay Area. Wedding Collections with Janae begin at $4,800 and with Julia at $3,200.